I’ve written before about the brilliance of signatures. The link between time past and time present. The idea that the object you are holding was once held by some historical figure (not necessarily famous) who left their mark for eternity; an inky link between us and them. Those historical events don’t have to have happened hundreds of years ago. The relatively recent can be as resonant as the distant past. Such is the case with the Working Class Movement Library’s copy of Lewis Minkin’s The Contentious Alliance . The book was a present to Stan Orme, and donated to the Library recently by Stan’s wife Irene, a staunch Library supporter and volunteer. Stan was chair of the Parliamentary Labour Party, when the Shadow Cabinet donated the tome to him. Orme’s career was a varied and successful one; his five years as chairman of the party had followed stints as a junior minister in Northern Ireland, and minister for Social Security. During the miners’ strike between 1984 and 1985 Orme served in the unenviable role of shadow Energy Secretary. He retired in 1997 after serving as Salford MP since 1964, and was elevated to the Lords. The presentation of the book came during a period of significant change for the Labour Party. Neil Kinnock, whose signature is at the top of the sheet, had resigned the leadership following the party’s defeat at the General Election in April. Only days after the book was inscribed, John Smith (signature bottom left) became leader of the party. And in 1994 following Smith’s untimely death Tony Blair (signature bottom right) would be elected leader. 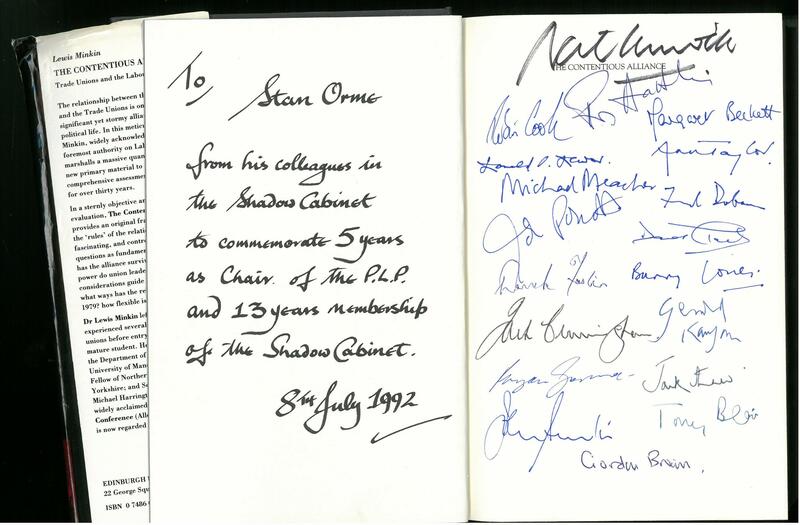 The page contains the signatures of many leading figures in the New Labour era. Blair of course, but also John Prescott, Robin Cook, Frank Dobson and Margaret Beckett who would become the UK’s first female Foreign Secretary. The other notable signature is of course Gordon Brown. Given the title of the book it seems apt that the signatures of the two chief architects of ‘New’ Labour appear together; their own contentious alliance was just beginning. This entry was posted in Handwriting, Labour History, New Labour, Uncategorized and tagged Frank Dobson, Gordon Brown, inscription, Margaret Beckett, signatures, Stan Orme, Tony Blair. Bookmark the permalink.